This weekend I did something pretty cool. Ok, I did a few things that were pretty cool, but one of those involved strapping white ABS plastic to myself and behaving like a lunatic. All in the name of fun. 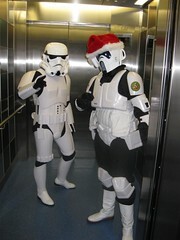 My first Tour of Duty involved fronting up to the Mater Hospital and trooping around the Childrens wards delivering Star Warsy christmas gifts to the kids. I felt like a total prat and a complete fraud, right up until the first parent came over with the worlds biggest smile and shook my hand. And, right at that point I was sold. I couldn’t stop smiling. It didn’t matter that my armour was digging into my thigh and my hip, it didn’t matter that my belt kept slipping or my shoulder kept flipping – nor did it matter that I had had only 3 hours sleep. I would have stayed in that suit for half a year, and had to be asked twice to get out of costume. I am now a total 501st groupie. FOR THE EMPIRE! FOR THE MIGHTY 501st! I cant wait to do it again. Not being good with words myself I will let the following say it for me.